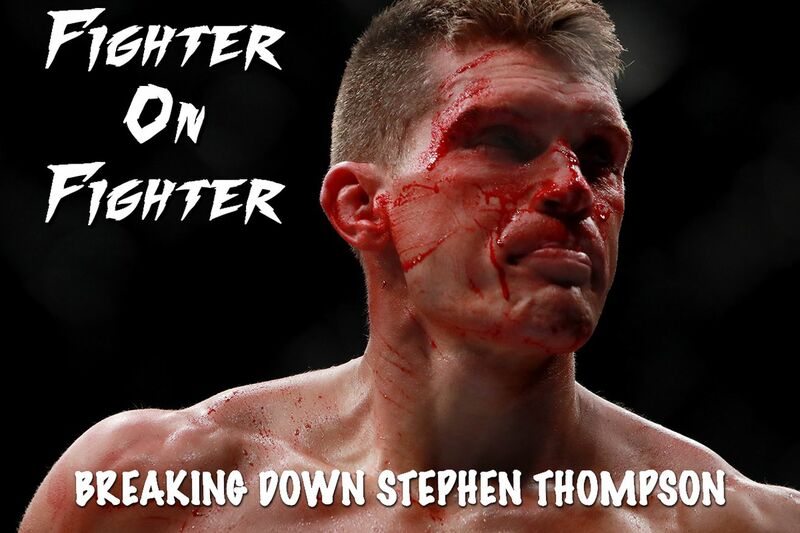 MMAmania.com resident fighter analyst — and aspiring professional fighter — Andrew Richardson breaks down the mixed martial arts (MMA) game of UFC 209’s Stephen Thompson, who will look to capture the crown this Saturday (March 4, 2017) inside T-Mobile Arena in Las Vegas, Nevada. Karate master, Stephen Thompson, will rematch with Ultimate Fighting Championship (UFC) Welterweight kingpin, Tyron Woodley, at UFC 209 this Saturday (March 4, 2017) inside T-Mobile Arena in Las Vegas, Nevada. Thompson did not leave the cage with a strap around his waist following his title fight just about five months ago, but he came far closer than most. Following their draw, the need for a rematch was apparent, and luckily it has all come together in a short amount of time. Despite nearly earning the decision last time out, Thompson was also on the wrong end of a beating that almost stopped the fight. In this second collision, Thompson will have to make some adjustments, which could be rather difficult considering how Thompson has been fighting and winning with his habits for a lifetime. Thompson is one of the most credentialed strikers in UFC. He’s a fifth-degree black belt in Kempo Karate, black belt in American Kickboxing and has 20 professional kickboxing victories to his name. Inside the cage, Thompson has scored seven victories via knockout. Thompson’s stance reflects his karate background. While he primarily works from Southpaw, Thompson will occasionally move into Orthodox. Either way, Thompson keeps his stance very wide and stands nearly sideways, meaning that his foot is not pointing toward his opponent. There are pros and cons to both aspects of this stance. With that wide stance, Thompson can move quickly and shift his weight back-and-forth easily, which helps him circle away and counter punch. However, it can leave him open to low kicks, as his weight is rarely correct to check the strike. Similarly, Thompson’s lead leg pointing in exposes the back of his leg and allows it to be kicked out of position. Luckily, Thompson’s distance control — the center piece of his entire attack — has kept him safe from low kicks for the most part. That said, Woodley did find success with them, as his approach of simply waiting for “Wonderboy” to engage forced the Karateka into striking distance. Woodley never truly committed to destroying his foe’s lead leg, but he often knocked his opponent off-balance when he did throw them. Thompson’s karate-style stance — as well as excellent dexterity — opens up many of Thompson’s kicks, lead leg or otherwise (GIF). These lead leg kicks, usually thrown from Southpaw, are a huge part of his game, as they help him strike from a further distance than his opponent can match. Because these kicks are both varied and pivotal to his attack, lead leg kicks are the technique I analyzed in this week’s technique highlight. While Thompson will go on the offensive with punches, those moments are few and far between. Most of the time, Thompson will either look to catch his opponent off-guard with a quick flurry of straight shots or simply be trying to line up a kick. In his last bout, however, Woodley’s patience and wrestling forced Thompson to box from the pocket far more often than usual. In the vast majority of exchanges, Thompson was the sharper man in that range as well. Staying long, Thompson stung his opponent with combinations of jabs and crosses, looking for hooks if Woodley was circling into them. Since Woodley allowed himself to be trapped along the fence, Thompson often found success with crosses to the body as well. This is where Thompson found much of his success, but the right hands Woodley returned with were far more damaging, even if they were fewer in number. Alternatively, Thompson’s flurries tend to work very well for him. The best example of this came in his title eliminator victory over Johny Hendricks. Hendricks is hardly the most fleet-footed fighter, and Thompson was able to catch him flat multiple times by suddenly springing into a series of punches and kicks. Many of Thompson’s punches come as counters, as he is excellent at outmaneuvering his opponents with lateral movement and pivots (GIF). Thompson is one of the few fighters who truly excels at getting a strong angle on his opponents, forcing them to turn into him and eat punches. One of Thompson’s favorite attacks of that style — which can be used as his opponent comes forward or as a lead — is the darting cross or drive by, a common tactic of men like Eddie Alvarez and Dominick Cruz. Basically, as Thompson steps into the cross, he allows the motion of the punch to carry him past his opponent into safety. If he chooses, he can plant his feet once more in the opposite stance after landing the dart and strike from an advantageous angle. The difference between Thompson’s use of the punch and most other fighters’ is significant. Rather than look to merely touch his opponent and then follow up or slide away, Thompson springs into the punch with power. In his bouts with Robert Whittaker and Chris Clements, “Wonderboy” used this setup to secure the knockout finish (GIF). One of his most interesting following ups to the dart is returning to a lead leg kick. After darting with a cross from Orthodox, Thompson will land in the Southpaw stance, where he likes to throw the aforementioned kicks. Opposite Woodley, for example, Thompson landed the dart and then jammed a side kick into Woodley’s neck when the champion attempted to pursue him. Often, Thompson makes use of his excellent distance control and movement to frustrate opponents and force them to reach for him. Once that happens, Thompson will look to sting his opponent with lead hooks or suddenly halt his movement with a hard cross (GIF). Thompson deserves to be put on a list for most-improved in regard to his wrestling. Following his loss to Matt Brown, Thompson has shown steady improvement in this part of his game, becoming a very difficult man to wrestle to the mat. When looking for his own takedown, Thompson relies on strong, MMA-style running double legs that have become common for lanky strikers. He shoots for them as reactive takedowns, setting them up as though he were looking to counter punch, but instead changing levels and driving his opponent off their feet. These takedowns are an extension of his kickboxing, relying on the same angles and ability to read his opponent, even if the takedown itself is not a natural part of his game. Additionally, Thompson has showed a bit more to his wrestling game. He’s looked for the single leg takedown a few times with mixed results and has even scored with a knee pick. Since Thompson circles and pivots while he moves, he rarely gives his opponent an easy shot. Often, they’re forced to wrestle from a bad starting position, which allows Thompson to get his hips back and out of danger before his foe can accomplish much. Plus, his sideways stance makes double leg takedowns difficult even when facing him head on, and lanky, well-balanced strikers like Thompson are generally poor targets for a single leg shot. In Thompson’s bout with Hendricks, he only had to fend off one real takedown attempt. Hendricks closed the distance early and managed to nearly finish a double, but Thompson did a very nice job of posting on the mat, leaning on the fence, and keeping himself from being flattened. Once back to the clinch, Thompson worked patiently to turn his opponent and escape, leaving Hendricks to once again face the unenviable task of closing range. In five rounds, Woodley took Thompson down just once following a poorly set up low kick in the first round. A purple belt, Thompson has yet to display much offensive jiu-jitsu. He has not attempted a single submission inside the Octagon, nor has he really spent much time advancing position on the mat. Defensively, Thompson’s grappling is focused on control more than anything else. In the first round of his bout with Woodley, Thompson retained guard and did not allow his opponent to land anything particularly significant for a pretty extended period of time. However, when Thompson opened his guard and tried to kick Woodley off him near the end of the round, he opened himself up and absorbed a fair amount of damage. On the bright side, Thompson did show some composure in resisting a guillotine choke after being rocked in the fourth round. Woodley may not have been squeezing the choke properly — which is why the half-conscious Thompson was able to resist rather than sleep — but Woodley is still a ridiculously powerful man hanging on the striker’s neck. Despite the terrible position, Thompson fought hands and waited, allowing Woodley to burn himself out.